It is no secret that we love film music here at ThinkMuzik. As I have said numerous times, there is no such thing as bad classical music. And while film music isn't necessarily classical, the same rule holds true. 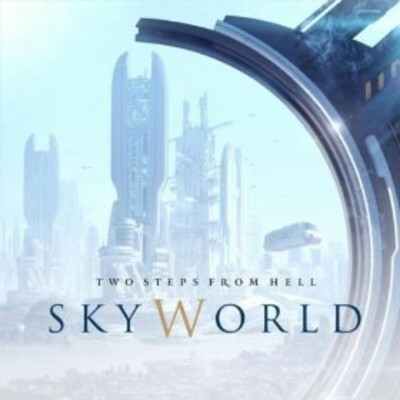 Two Steps from Hell's new public album "Skyworld" is not even film music per se. There is a little-known genre called 'trailer' music, which is a category "SkyWorld" fits in nicely. Most tracks are short compared to typical classical pieces and composed specifically for film, television, and video game trailers. The compositions on "SkyWorld" merge the old with the new, leaving no stone unturned for new ways to make contemporary music fresh and exciting. These tracks are soaring and epic orchestra pieces that incorporate guitars, horns, cellos, percussion, vocal melodies, and choral performances. In the world of contemporary music, this album is as eclectic as they come. A start-to-finish listen of this album conveys varying emotional and thoughtful reactions from the profound to the somber and everything in between. Including a track or two here does not do this disc its proper justice. This album as an incredible and rewarding listening experience. If you like contemporary and/or film music at all, this record is a must-purchase item. It is exceptional in every way possible. It surprises at every turn. The musical styles and tempos are virtually boundless and each track relates a unique visual and emotional perspective. The clarity on this disc is outstanding and the production is massive. All I can say is that my list for best albums of the year has just become a little more crowded. This is indeed top-ten worthy and will earn its keep nicely on any film music playlist. This album is available for purchase at iTunes and Amazon for a decent price. Don't bat an eye, because this album contains a whopping 22 tracks. Please enjoy the two tracks I have embedded here, and as always, thanks for reading! !